After nearly 2 months away from hockey due to a knee injury, I was chomping at the bit to play. Finally, I felt good enough to give it a go. The first game back would be my Friday co-rec league game, which also meant eats afterwards! Fate would have it, the game was at 11:30pm. When has 11:30pm become prime ice-time??? Well, the return to action was successful being a 3-2 win, but the options for eats after the game were slim to none. To spice things up a bit, there was a light dusting of snow with indications of more to come. No matter, I drove the SUV and so did Sweet Tooth. Milhouse laughs in the face of snow, so that wa sn't a factor for him either. With my sights set on 24-hour joints, I suggested we try Breka Bakery out on Fraser. I think I had Sweet Tooth at "desserts". For those who are unfamiliar with Breka, think of it as a simpler version of the ol' Bread Garden. With falling snow the size of cotton balls, we stuck with the plan undeterred. Walking into the place, Sweet Tooth was pleased at the selection of sweets. 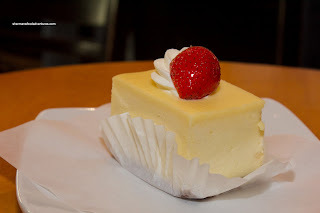 Normally, we frequent places which either do not have desserts or the desserts are of the Mario's Gelato boxed variety. Now, right off the bat, I need to mention that most of the items at Breka are very reasonably-priced, so expectations must be tempered. 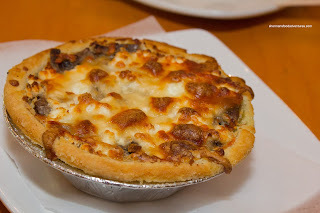 On that note, I had the Mushroom and Goat Cheese Quiche and it was pretty average. I guess it did the job in filling my stomach, but it lacked any punch. There was very little gaminess and I didn't get much taste from the mushrooms. For my sweet item, I had the New York Style Cheesecake. Probably due to sitting in the display case for an undetermined period of time, parts of the exposed cheesecake became rubbery. Once past that layer, the rest of the cheesecake was actually quite nice. Loved that it wasn't too sweet either. Sweet Tooth was considering in going crazy with several orders of dessert, but she wimped out and only got one order of Tiramisu. Okay, right away, we noticed there was something amiss with it. Rather than lady fingers, the bottom layer was comprised of sponge cake. A touch blasphemous, but not overly disturbing in the grand scheme of things when we ate it. 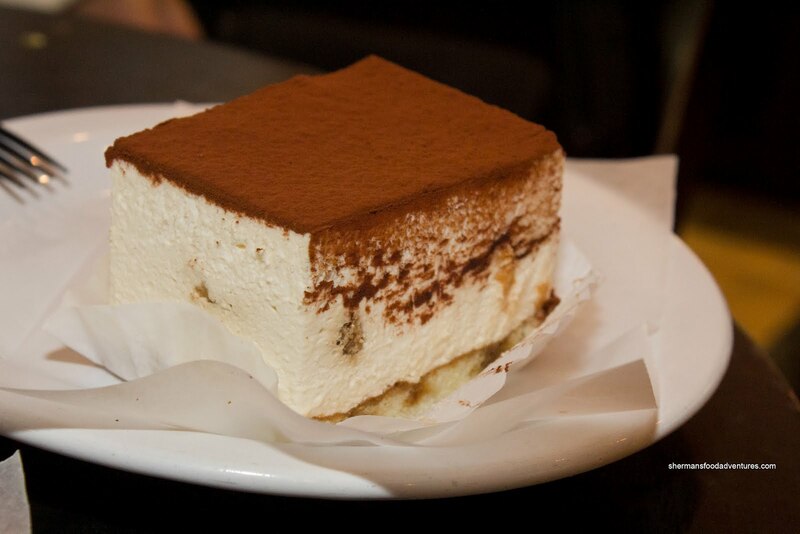 The tiramisu was light and not too sweet. We didn't get much in the way of espresso hits, but it was a pleasant dessert nonetheless. As for Milhouse, he was hungry. 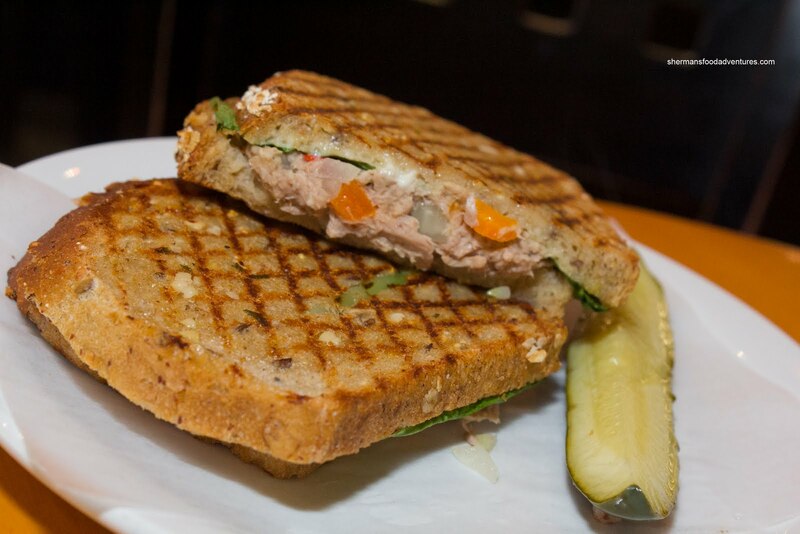 Therefore, he first had the Tuna Panini. Well, there was not much to comment on this other than it was toasted up hot and crunchy with plenty of tuna and veggies in the middle. It hit the spot for Milhouse without much complaints. 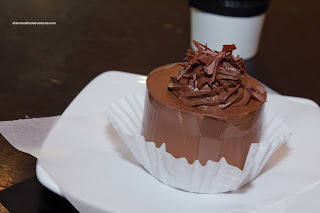 For dessert, he had the Chocolate Mousse which for all intents and purposes did the job. It was only semi-sweet and somewhat chocolaty. It wasn't a rich bittersweet chocolate taste, rather it was just flat chocolate. Not sure if I explained it correctly. The texture was alright, it could've been lighter. It wasn't terrible nor was it memorable either. 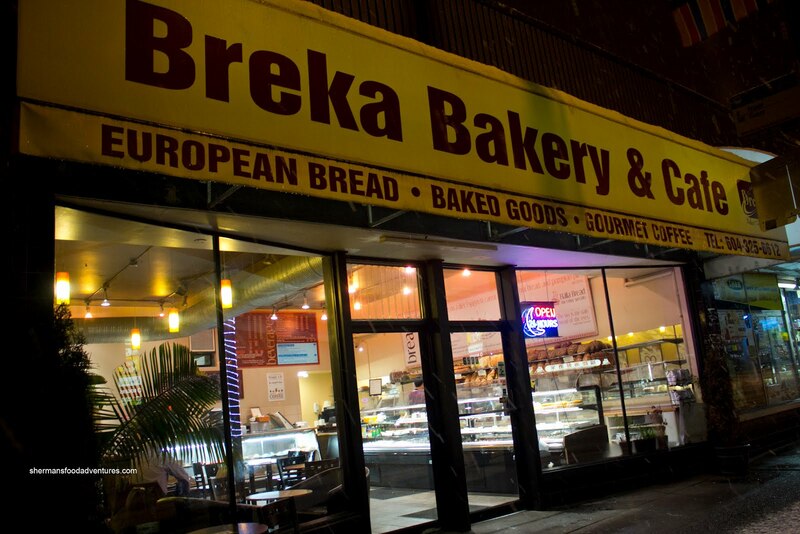 I guess that would be pretty much what Breka Bakery is about. There are some gems to be found, yet as a whole, everything is acceptable for a late night (or in this case, early morning) snack. It's not fancy and it certainly is not trendy, but at 2:00am, who really cares? I love Breka's. It's not amazing, but it's reasonable and one of the few late night places to go that doesn't involve alcohol or fried food. I agree with Sherman, Breka is meh. Although its 24-hr format appeals to me (not that I'm some graveyard-shift worker or anything like that) and they do have a wide variety of pastries and things, certainly beats Timmy's or other fast-food outlets after 10pm. But they often don't clean up the tables, the place can be kinda dirty and messy, and some of the sweets and desserts simply taste average. But for the prices they charge, I don't expect much more, and it's alright. @pattiez Yah, it is a great alternative to whatever else is there at 4am. @LR Same, it does the job for what it is intended to do. Sherman siad: "Yah, it is a great alternative to whatever else is there at 4am." There's Calhoun's which is better.